Point Pleasant running back Justin Brumfield (10) is chased down by Meigs defender David Robson as teammates Bailey Caruthers (12) and Landon Acree, right, also give chase during the first half of Friday night’s Week 8 football contest in Point Pleasant, W.Va.
POINT PLEASANT, W.Va. — This Friday the 13th slasher was named Cason, not Jason. 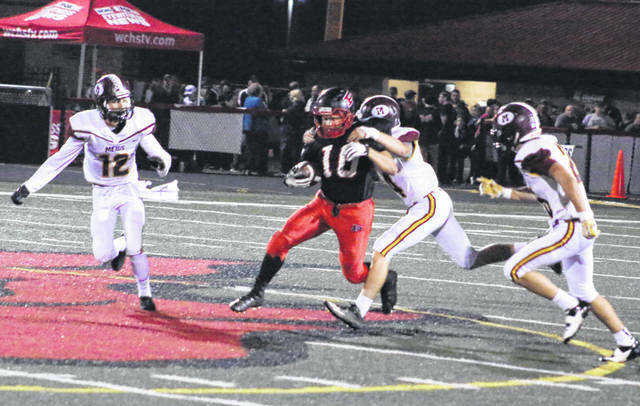 Quarterback Cason Payne ran for 210 yards, threw for 126 more and accounted for five of Point Pleasant’s eight touchdowns on Friday night during a 56-16 dismantling of visiting Meigs in a Week 8 non-conference football game at Ohio Valley Bank Track and Field in Mason County. The Big Blacks (6-2) — after playing five of their first seven regular season contests on the road — needed a little time to get reacquainted with their home surroundings, but the Red and Black eventually got things rolling late in the opening period. There were a trio of interceptions after sustainable drives on the first three possessions of the game, which put the ball back in the hands of Point at its own 49 with 4:21 left. Three plays and 51 yards later, the Big Blacks held a permanent lead following a 14-yard scamper from Justin Brumfield. Jacob Bryant tacked on the first of eight successful point-after kicks, giving the hosts a 7-0 edge with 3:35 left in the first period. Both teams traded punts into the second quarter, then the Marauders (3-5) took over possession at their own 40 less than a minute into the period. 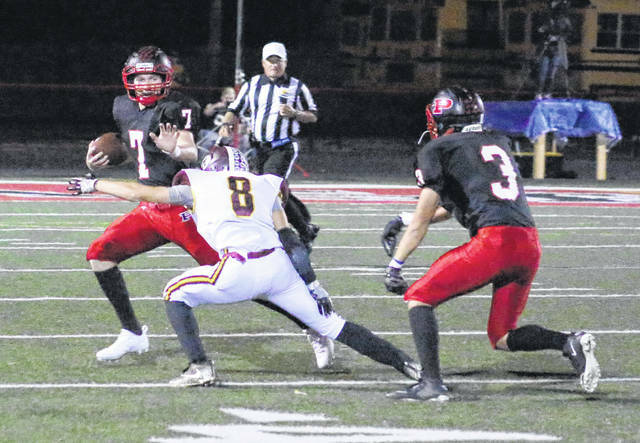 Facing a third-and-long, MHS quarterback Zach Helton was on his way down for a sack when he released a last-chance pass that went straight into the hands of Cameron Nott. Nott went untouched for a 35-yard return, making it a 14-0 contest with 9:44 remaining in the half. Meigs lost possession on downs and also punted on its next two drives, while the Big Blacks went through Payne on their next two drives. Payne found Josh Wamsley on a 59-yard touchdown pass that capped a six-play, 84-yard drive at the 3:47 mark for a 21-0 edge. Payne then broke away from a handful tacklers for a 70-yard scamper just before the half, allowing the Red and Black to secure a 28-0 cushion headed into the locker room. Statistically at the break, Point Pleasant owned a 262-154 advantage in total yards — including a 191-98 edge in rushing yards. Meigs, however, claimed an 8-7 lead in first downs despite being minus-2 in turnover differential. PPHS picked up right where it left off to start the second half as the hosts forced a Meigs punt at the start of the third, then Payne found Tucker Mayes wide open for a 17-yard catch-and run — giving Point a sizable 35-point cushion with 10:11 remaining. The Maroon and Gold finally struck paydirt at the 8:52 mark of the third as Cole Adams hauled in a 69-yard pass from Helton. Zach Bartrum added a successful PAT run for a 35-8 contest. Payne responded with TD runs of 24 yards and 58 yards over the next three-plus minutes of play, allowing Point to secure its largest lead of the game at 49-8 with 5:30 left in the third. The guests closed a bit of the gap at the 1:09 mark as Adams scored on a 6-yard run, then Landon Acree hauled in a pass from Cory Cox on the two-point try for a 49-16 contest. Nick Parsons wrapped up the scoring by plowing his way into the end zone from seven yards out, making it a 56-16 contest with just three seconds left before the final period. The game was televised live on WCHS-TV as its weekly Wendy’s Friday Night Rivals Game of the Week in West Virginia, and Payne was named the game’s Most Valuable Player after accounting for roughly 360 of Point Pleasant’s 558 yards of total offense. The Big Blacks also churned out 396 rushing yards on 32 attempts, an average of roughly 12.4 yards per carry. 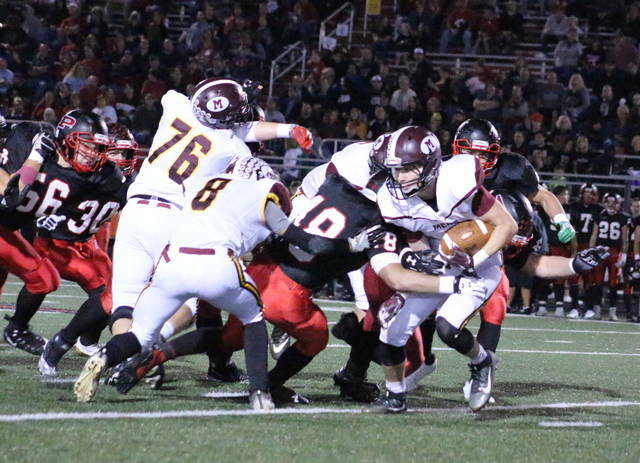 Meigs, conversely, produced only 290 yards of total offense — including 138 rushing yards on 41 tries. After the game, PPHS coach Dave Darst was pleased with his troops’ overall performance in a long-overdue game at home. “Our offensive line really played well tonight because they got after it up front, and what can I say about Cason Payne tonight except that that was one heck of a performance,” Darst said. “(Justin) Brumfield probably had over a hundred yards rushing and we made some plays on the perimeter. Offensively, we had a pretty good night … and the defense was pretty good too. MHS coach Mike Bartrum, on the other hand, gave praise to his adversaries while also noting that his squad can learn a few things from this loss as they prepare for the final two weeks of the 2017 campaign. “First, Coach Darst does a good job and he has a pretty good football team over there,” Bartrum said. “At the same time, when you play in a big game like this, you have to take advantage of every opportunity. We were knocking on the door a few times early, but we had some mistakes that could have made for a much different game headed into halftime. Point Pleasant claimed a 20-14 edge in first downs and finished the night plus-2 in turnover differential. PPHS was flagged 12 times for 95 yards, while the guests were penalized seven times for 63 yards. Payne led the Big Blacks’ ground attack with 210 yards and three scores on nine carries. Payne was also 7-of-11 passing for 152 yards and two scores while also throwing his first interception of the season. Brumfield was next with 113 rushing yards on 13 carries, while Wamsley added 26 yards on four attempts. Wamsley also led the wideouts with 85 yards on four catches. The Marauders received a team-high 64 yards from Zach Bartrum on 13 carries, followed by Lane Cullums with 42 yards on nine tries. Helton also had 32 yards on 10 totes and finished the night 6-of-20 passing for 126 yards, throwing one TD and three interceptions. Adams led the Meigs’ receivers with three grabs for 78 yards, while Bartrum added 30 yards on two catches. 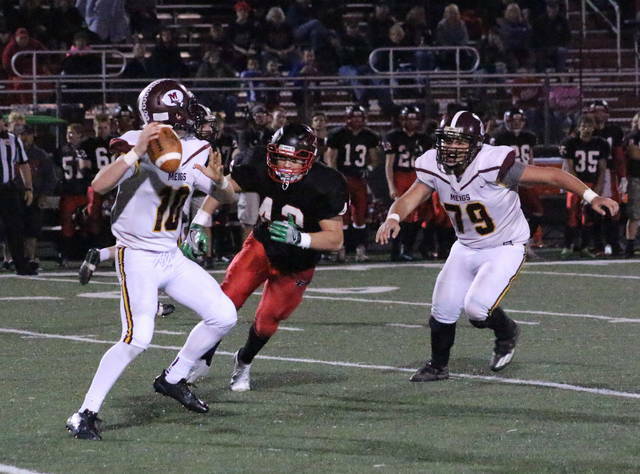 Nott, Aaron Turner and Alec Smith each came away with an interception for the hosts, while Adams had the Marauders’ only takeaway from the night. Point Pleasant returns to action Friday when it hosts Man in a Week 9 contest at OVB Field. Meigs travels to Wellston next Friday for a TVC Ohio contest. Both games will kickoff at 7:30 p.m.